... 1940, a daughter was born poor and premature in Tennessee, the 20th of her father's 22 children (in the course of 2 marriages). She weighed just 4.5 pounds and endured many illnesses during her childhood – including polio, which left her leg twisted and required years of metal braces and other treatment. Better by age 12, Wilma Rudolph (right) began competing in sports. 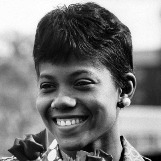 (photo credit) Four years later, the teenager had shared a bronze medal with U.S. teammates, for placing in the 4x100-meter relay at the 1956 Olympics in Melbourne, Australia. At the 1960 Olympics in Rome, she "became 'the fastest woman in the world' and the first American woman to win three gold medals in one Olympics," including the 200-meter win depicted below (credit). Back home, Rudolph stood up to her state's segregationist governor, so that "Rudolph's parade and banquet were the first integrated events in her hometown of Clarksville." Rudolph, nicknamed "Skeeter" on account of her speed and her 5-foot-11, 130-pound build, retired at age 22. At age 54, she died from brain cancer, then the mother of 4 and grandmother of 8.